The four new elements that will be included in the seventh row of the table. Four new elements, including two with Russian associations, are being included in the Periodic Table of chemical elements, a report stated. These are Nihonium, Moscovium, Tennesine and Oganesson. The four brand new elements were discovered by Russian, Japanese & American researchers. Exciting new developments are taking place on the Periodic Table of chemical elements, first developed by Russian chemist and inventor Dmitri Mendeleev in the 19th century. 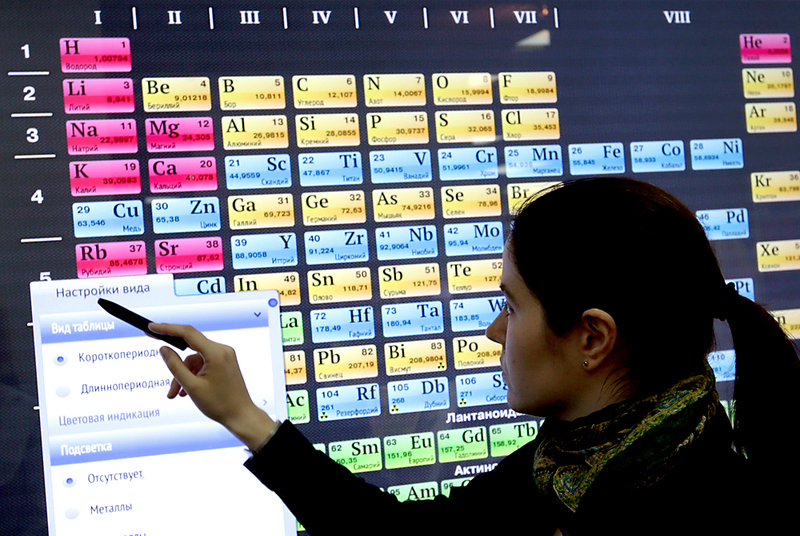 Four new elements have been approved for a place on the Periodic Table; Moscovium, Nihonium, Tennessine & Oganesson. Of the four, two have names associated with Russia. Meanwhile, in India, a twelfth grade student has devised an interesting way to remember the names and symbols of all the elements. The four new elements that will be included in the seventh row of the table, the International Union of Pure and Applied Chemistry (IUPAC) has proposed, according to a report on Wednesday on the Union’s website. The new elements will be named Nihonium (Nh), Moscovium (Mc), Tennessine (Ts), and Oganesson (Og). Elements 113, 115, 117, and 118 were formally recognized by IUPAC in December, but the IUPAC has now presented the list of names that were proposed by the people who helped discover them. Unless there is strong public opposition to the new names by November 8, 2016, the IUPAC will enshrine the elements into the table permanently. Nihonium and symbol Nh, for the element 113, Moscovium and symbol Mc, for the element 115,Tennessine and symbol Ts, for the element 117, and Oganesson and symbol Og, for the element 118. The International Union of Pure and Applied Chemistry is the global authority on chemical nomenclature and terminology, including the naming of new elements in the periodic table. They are also the ultimate authority on standardized methods for measurement; and on atomic weights, and other such critically-evaluated data. A neutral and objective scientific organization, IUPAC was established in 1919 by academic and industrial chemists who shared a common goal – to unite a fragmented, global chemistry community for the advancement of the chemical sciences via collaboration and the free exchange of scientific information, their website states. The IUPAC Inorganic Chemistry Division has reviewed and considered these proposals and recommends these for acceptance. A five-month public review has now been set, ending November 8, prior to the formal approval by the IUPAC Council. A 17-year-old Indian schoolgirl has recently come up with an imaginative way to remember all the elements on the periodic table for her science class. Kaanchi Chopra, a twelfth grade science student from New Delhi and an aspiring artist, decided to recreate the periodic table and remember the symbols to highlight 90 global issues, using the acronym of each element to highlight a particular problem. The student designed the table over the course of a week, using every public problem or issue ranging from malnutrition to body shaming and xenophobia in the table. She also focused on broader issues and social movements such as reproductive rights, net neutrality and LGBT rights. She hit upon the idea while flipping through her chemistry textbook. "I was reminded of how we used to make numerous mnemonics to memorise the elements and realised that each and every symbol of the elements in the periodic table was an acronym of a global issue," she wrote to the website Mashable. Nihonium (Nh) is the proposed name for element 113 because it was discovered at RIKEN in Japan. It will be the first element to be named after a location in East Asia. ‘Nihon’ is one of the two ways to say “Japan” in Japanese. Element 115 has the proposed name of Moscovium (Mc) after the location of the Joint Institute for Nuclear Research in Moscow, Russia, where the researchers synthesized it. “Moscovium is in recognition of the Moscow region and honours the ancient Russian land that is the home of the Joint Institute for Nuclear Research, where the discovery experiments were conducted using the Dubna Gas-Filled Recoil Separator in combination with the heavy ion accelerator capabilities of the Flerov Laboratory of Nuclear Reactions,” IUPAC said in the press release on Wednesday. Element 117 has the proposed name of Tennessine (Ts), referencing the US state of Tennessee which is home to the US Oak Ridge National Laboratory. According to the IUPAC’s rules, newly discovered elements can be named after a mythological concept or character, a mineral, a place, a geographical region, a property of the element, or a scientist. “It is a pleasure to see that specific places and names (country, state, city, and scientist) related to the new elements is being recognized in these four names. The names are completely in accordance with IUPAC rules,” said Jan Reedijk of Leiden University, who corresponded with the various laboratories and invited the discoverers to make proposals.